Since the Vegetarian Society launched their breakfast butty competition, I've been trying to think of the perfect entry. After thinking of all the usual sausage sandwiches, veggie bagels etc I decided to go a completely different route and make a vegan version of huevos rancheros and as it's supposed to be a 'butty', I thought there was no better way of making it a portable breakfast than to roll it up in to a burrito. I've always wanted to make huevos rancheros, but my hatred for eggs had stopped me until I realised I could make it with scrambled tofu. I swear to god that tofu scramble is much, much better than egg and I hope that this recipe would make it's sort of 'meaty impostor hang it's heads in shame'. It's full of everything you need for the morning, protein, fresh raw veggies and a mild chili kick to get the day started. I did try to get a picture of it all rolled up, but I was being impatient (because I wanted to eat it) and it came out rubbish so you'll just have to use your imagination! I made homemade salsa and guacamole because it's super easy and tastes lovely and fresh, but you can use store brought as well. Mix all of the ingredients in a bowl until well combined. Pop all the ingredients in to a food processor and blitz until guacafied. Melt the vegan margarine in a sauce pan and crumble the tofu in. Add the turmeric, paprika, mixed herbs and soy sauce and fry until it starts to brown. Gently heat the tortilla wrap in a large frying pan, then transfer to a plate. 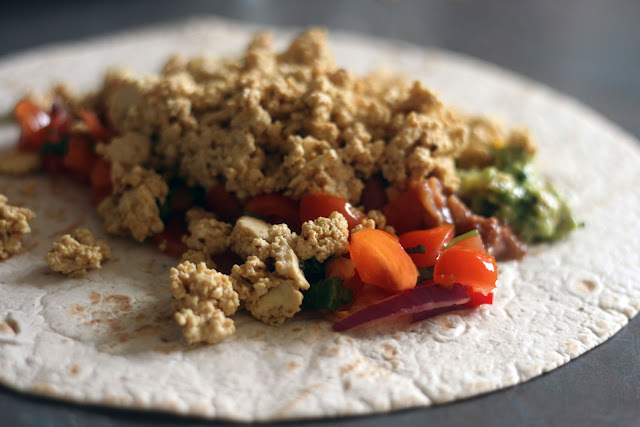 Spoon the salsa, guacamole and refried beans on to the wrap then top with the tofu scramble. 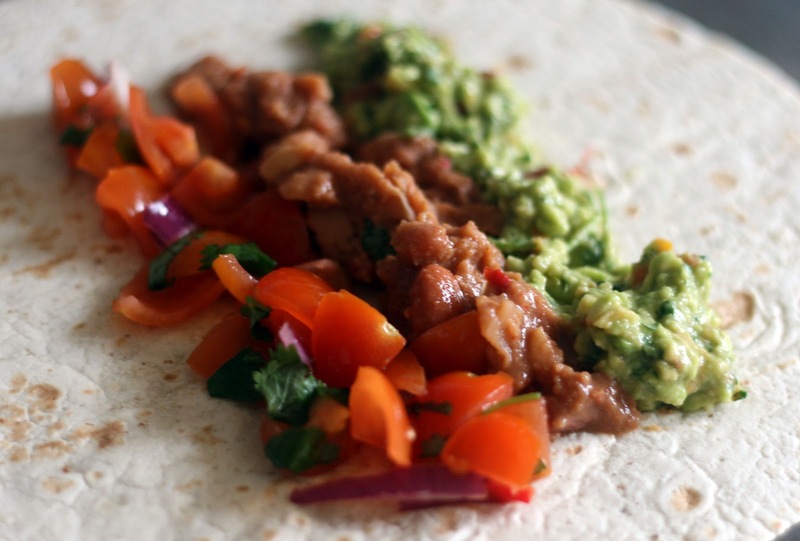 Fold the ends in and roll it up in to a burrito and enjoy!